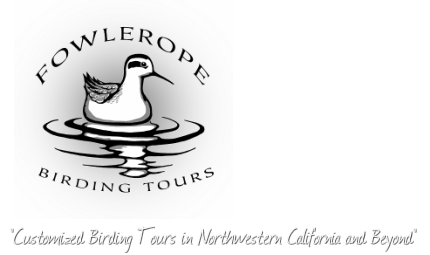 You can expect exceptional and enthusiastic professional guiding service from a local birder that has thorough knowledge on the status and distribution of almost all of the expected bird species--plus the vagrants and rarities--in Northwestern California and where and how to find them. I am also familiar with many other regions in California and have birded in most of the state's 58 counties and can easily design a tour for whatever birding "need" you may have to find the species you would like to see in any of these regions. I charge $25 per hour and will be your guide for whatever amount of time but do have special pricing for 1/2 (5 hours) and full day (8 hours) tours. If you choose not to select the 1/2 day or full day options below and want an open-ended tour (no time limits) then my rate is $25 / hour for 1-4 people. Hourly rate: $25 / hour. Example 1: Six people sign up for a day tour and want to bird for 10 hours. Therefore I charge the full day rate ($175) + 2 additional hours (2 x $25 = 50) 2 additional people (2 x $25 = $50) = $275.00 (minus the $50 deposit). If each person were paying their fair share that would only be around $70 per person. Example 2: Two people sign up for a day tour and we go birding for 12 hours. I charge the full day rate ($175) + 4 additional hours ($25 x 4 = $100) = $275 (minus the $50 deposit). Example 3: Five people sign up for an 8-hour tour. So $175 + additional person ($25) = $200 (minus the $50 deposit). Example 4: Seven people sign up for a 1/2 day tour. I charge for a 1/2 day ($100) and then 3 additional people (3 x $25 = $75) = $175 (minus the $50 deposit). I don't charge a different rate for night birding like owling. When you sign up for a tour with me I would like a $50 deposit in advance to "lock in" your date(s) you have signed up for for my services well in advance (like a month or weeks beforehand). Deposits are non-refundable and I take checks or money orders. I take cash or checks for whatever time you hire me for, minus the deposit. To keep my rates low you provide the vehicle, rental or personal. If it is a rental vehicle and you would like me to do the driving you MUST INCLUDE MY NAME ON THE RENTAL AGREEMENT. I also have to sign the rental agreement so if you rent the vehicle out of the Northwestern California region and you'd like me to drive please make sure that that same rental agency has a location here so I can sign the rental agreement, also. If we are planning a tour with 5 or more people then I will rent an appropriate vehicle and charge accordingly for the rental + rental insurance and mileage + my hourly rate. I also have gift certificates available. I have 1/2 day ($100 for 5 hours) and full day certificates for full days ($175). If you'd like a gift certificate for a different amount please contact me. If you'd like to buy a gift certificate from me online you can use the paypal buttons below for the 1/2 day or full day options. Gift Certificates are good for 1-4 people and do not include transportation (you drive).